This is the master video montage we made summarizing what students are saying about the lessons. If you only watch 1 video here, let it be this one. Taylor is also a Ph.D. student at Cornell and started as almost a complete beginner and now can jam with virtually anyone. This is Doug, who is a highly experienced guitarist who used to play in regularly gigging bands in the 80s and 90s. 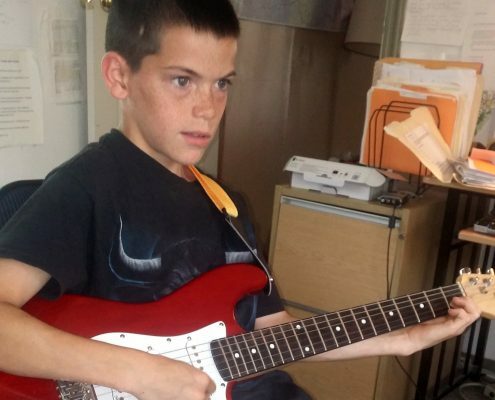 Andrew is a very creative kid who plays and sings at his school’s talent shows and is now learning to play lead guitar. Kara is a Cornell Ph.D. student who knows that playing guitar is a great hobby she can use to take a break from studying or lab work. This testimonial is from a compete beginner named Yue. Look how much she learned after only 1 month of lessons! Listen to what Tim and Barb both say about how you can get better and have fun even while being a busy adult without much time for guitar. 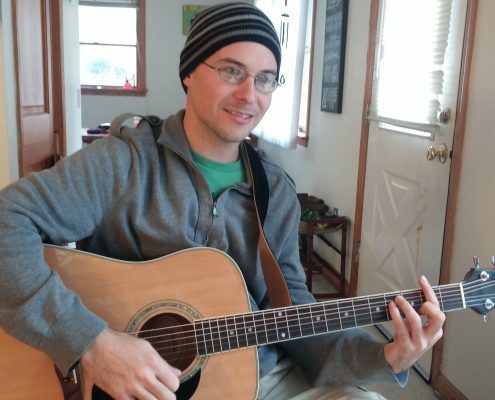 Matt works at Cornell and is coming along nicely on guitar, even writing his own songs. Brian and Kaye talk about how the lessons are motivating and fun, and rich with content but never overwhelming. Art has been playing guitar for many decades but had many questions about how to put it all together. He is so much more confident now and performs with his wife. “Dennis is really encouraging, and he follows exactly what my goals are and teaches me relative to those goals. He makes things really easy, attainable and approachable, not intimidating. 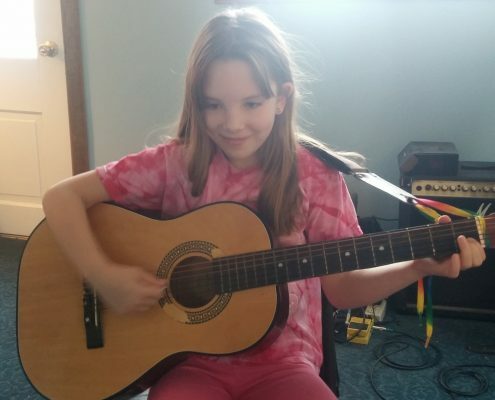 I have learned an incredible amount in a short amount of time and can play so much music now.” – Frank D.
“My son Nial is learning so much faster now with Dennis than he was with his former teacher. “- Angie B.
Michele is a professional flute player who wanted to expand her horizons and came to Dennis to learn how to play jazz. She is one of the few students who is not a guitarist. “Dennis is an excellent instructor. He has been super patient with my 8 year old daughter yet still pushes her to give her best and keep at it when she becomes discouraged. I would recommend Dennis to anyone looking to learn an instrument or even to just improve upon their skills as a musician.” – Hank B. “Dennis is an outstanding teacher. I have found him to be very knowledgeable, patient, and fun to work with. His teaching method is very effective, in that weak spots become apparent, without the student being discouraged. A plan to improve is mapped out which is also very effective. There are no shortcuts, but the hard work pays off. 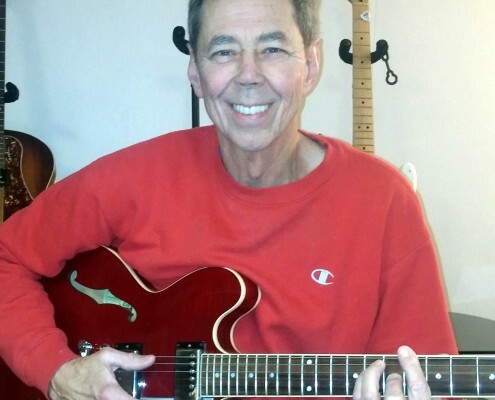 The great thing is, I am having a blast while getting better!” – Dave F.
“I absolutely recommend Dennis Winge as a guitar teacher. When I first started thinking about playing jazz I had no idea where to begin, although I was an experienced rock guitarist. It was great to learn how to use what I already knew as well as learn new things in an easy and fun way. We went over my goals in detail when I first started and now I am happy to say I have accomplished almost all of them. One of the biggest goals I had was to be able to play a song’s melody and chords at the same time. Now, not only do I have a few of those memorized, but I also understand the process of how to do it. Recently I wrote out and played a tune I like on my own with only very little help and I will be able to take that skill with me for the rest of my life. 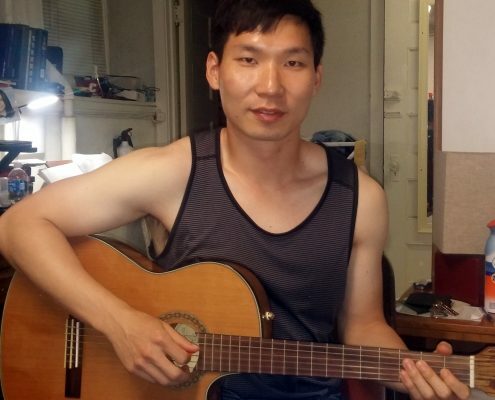 I am proud of my accomplishments and none of them would have been possible without Dennis’ help.” – Andrew S.
When I first came to Dennis I knew a lot of things (chords, picking, soloing techniques) but I didn’t know how to put any of it together, and I had so many bad habits, it was horrible! I couldn’t play with anybody because I couldn’t play songs in rhythm. Three years later, with steady guidance from Dennis, I have my own band and have been going to jam sessions. 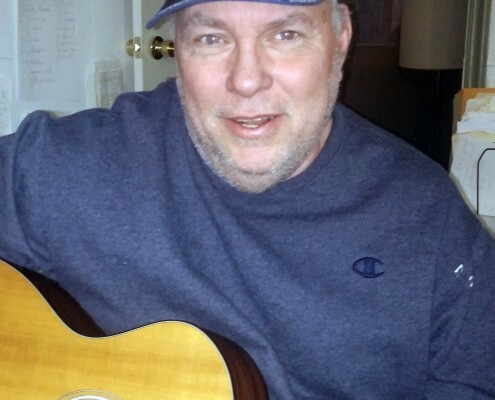 My soloing still needs work, but overall I’m having a great time on the guitar.” – Dan W.